The hippo sculpture in the Pangea showroom always attracts a lot of attention. Created at life size it is a stunning representation of this unique animal with its sheer bulk and curious expression. The hippo seems to return the watcher’s gaze, taking everything in and giving it solemn consideration before wandering away to sink into a water hole somewhere, just leaving it’s nostrils, eyes and ears above the surface. Our hippo is beautifully detailed, right down to the bristly hairs that cover the animal’s snout and it is this attention to the animals’ features that really bring our sculptures to life. We are delighted to include this deceptively graceful animal in our collection of metal sculptures, which are all handmade in Africa by a team of artisan craftsmen. 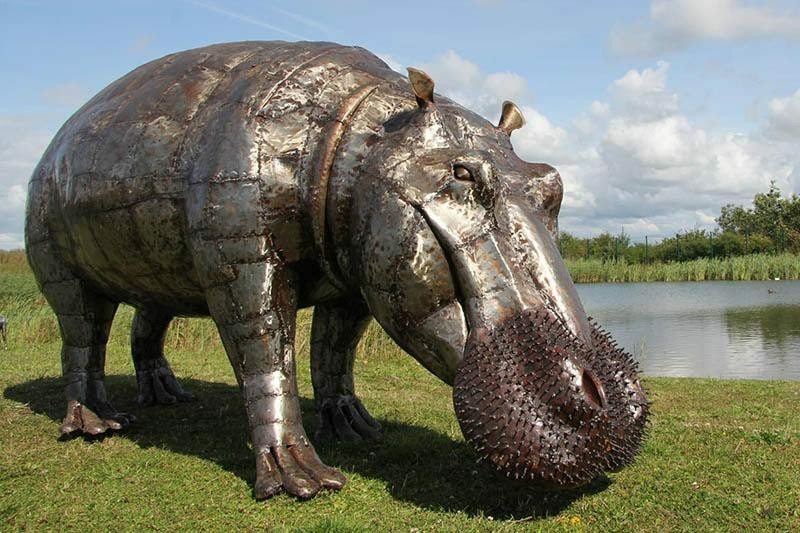 Each animal is individually made from recycled sheet metal and other metal elements and the hippo stands at approximately 1.5m tall and 3.4m long. Although these dimensions may vary slightly due to the handmade nature of each piece, the hippo will always be an impressive sculpture to own due to its sheer size. The sculptures are hand finished in the UK and the glossy protective lacquer that is applied particularly suits the animals that you would expect to see near water such as the hippo. The details of the welded construction are highlighted and it would seem like the hippo sculpture has just taken a dip in a lake or swamp. Hippos are also nicknamed “river horses” due to their love of water, where they spend up to sixteen hours a day submerged to keep themselves cool in the heat of the African sun. They are known for being good swimmers and graceful in the water, but they can also reach surprising speeds of up to 30 miles per hour on land, although this can only be sustained over a short distance due to their size. Hippos can hold their breath for up to five minutes and can stay in the water comfortably for long periods as their eyes and nostrils are high up on their heads, so they can breathe easily and keep a watchful eye out for predators. Hippos can be quite aggressive and are equipped with fearsome jaws and tusks, so crocodiles will pick a sickly animal or a young hippo if they tackle them at all, but most of the time these animals manage to coexist, with hippos tending to congregate in groups to seem even more intimidating. When they choose to bask on the shoreline or come out of the water to feed their skin secretes a red oily substance which acts as a skin moisturiser and sunblock to give them added protection against the climate. Hippos are such unique and interesting creatures that their appeal is unsurprising. They have been depicted in some memorable animation and their somewhat lumbering gait can be comical to watch, as long as they are not in pursuit! This gentle aspect of their character is what people seem to associate with our delightful hippo sculptures with their calm stance and knowing expression. Amazing sculptures, out of this world!! Absolutely beautiful sculptures. Not just the large ones. The smaller ones would do any home proud. Liked the eagle great movement. May get one later in the year. Lady in showroom was very helpful. 😁👍👌 Must for a visit if your in Ormskirk. The showroom at Ormskirk is very impressive and definitely worth a visit to see the scale of the sculptures. We left with one of the baby elephants, really pleased. I love this place! Really is incredible what they accomplish, and how it is achieved. I left with two of the smaller sculptures as Christmas presents and they are fantastic quality. I will nit-pick, a member of staff could have helped with the door on the way out, but other than that, great visit. This place is different. I took a friend, we thought it was excellent. Fantast shop. Fantastic staff. Fantastic product. Excellent and unique shop for the sale of social enterprise animal sculptures made in Africa . Awesome sculptures. Showroom and staff are wonderful. The Pangea team are all knowledgeable about these exciting sculptures and are committed to excellent customer service. Let us help you find the perfect sculpture for your home or garden.